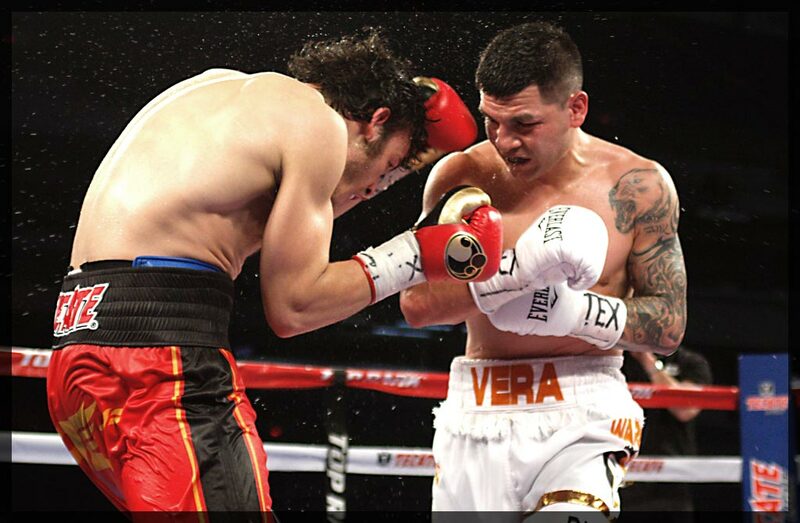 Vera Shows Unflinching Effort Against Chavez Jr.
Julio Cesar Chavez Jr. registered his 2nd victory over Bryan Vera in 7 months by scoring am entertaining 12 round unanimous decision in a Super Middleweight bout at the Alamodome in San Antonio, Texas. Chavez was much better then the lethargic version of himself in September as he started quickly being much more active. He was dominant with body punches and hard right hands to the head. Vera showed an incredible heart and chin as not only did he withstand the Chavez assault but he came back with flurries of his own. It was a fast paced and exciting fight that saw a lot of contact. Vera was docked a point in round eight after being warned by referee Rafael Ramos for different fouls. The point was a dubious deduction as it looked like Vera did not do anything to warrant the point loss but Chavez complained several times and the referee “bought” those complaints. Chavez outlanded Vera in every round and then coasted in the 12th as he refused to engage and stay out of harms way and won by scores of 117-110 twice and 114-113. Vera put up a great effort despite hurting his hand in the 4th round. Chaveez Jr., 167 1/2 lbs of Culican, MX is now 48-1-1-1. Vera, 167 1/2 lbs of Austin, TX is now 23-8.